Probably because it is part of the Pearl River Resort, Geyser Falls is a unique water park. It devotes a fair amount of attention to themeing, including the namesake geysers that spout near the front of the park. In addition to the usual assortment of water park attractions, the park offers Clearwater Key, a lush eight-acre oasis of sandy beaches. It also includes a full-service restaurant with live bands. Occasionally, Geyser Falls even features national acts performing on its outdoor stage. Mt. Everwet is a collection of three speed slides, two of which are open and one that is enclosed. 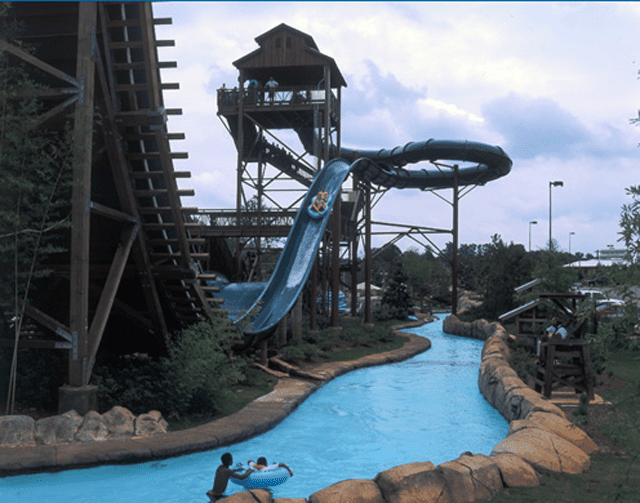 Unlike most water parks, which are located on fairly level ground and build slide towers, Geyser Falls uses the natural topography of its hilly property. The Mt. Everwet slides careen down a 60-foot hill. Likewise, Whitewater Express is a four-lane mat-racing slide that is built into the park's hillside. Backsplash is an intriguing half-pipe ride that sends riders in two-passenger tubes shooting down a U-shaped track and up into an rush of water that sends the tubes careening backwards. It is the first ride of its kind in the U.S. Pipe's Peak sends riders in two-passenger rafts soaring down its slide nestled in the trees. It ends in a bowl that swishes the rafts around a few times before sending them into a splash pool. Thunder Lake is the park's huge wave pool. Roundabout River is a long, lazy river. In addition to the water park, the Pearl River Resort includes three casinos as well as hotels, golf courses, a performance theater, restaurants, a spa, and other amenities. Find hotel rates for Pearl River Resort at TripAdvisor. Unlike most water parks, Geyser Falls has a generous assortment of restaurants and in-park dining options. The Beach Club is a full-service restaurant with pub fare, a bar, and live entertainment. Two additional cafes have more traditional park-style fast food, but offer a wide range of choices. The actual address is 209 Black Jack Road. Open mid-April to early September. Check with park for actual days and times. Discounted rates offered for children (under 48") and seniors (60 and over). Toddlers and infants ages 3 and under are free. Group rates and season passes are available. The address is 209 Black Jack Road. From Jackson: Hwy 25 (Lakeland Drive) to Hwy 16E through Carthage. Follow signs to Pearl River Resort. From Atlanta: Hwy 20W to Birmingham. Hwy 20/59 to Meridian, MS. Exit 150 in Meridian to Hwy 19N to Philadelphia, MS. Left on Hwy 16, left on Hwy 15, and right onto Hwy 16W. Follow signs to Pearl River Resort. From New Orleans: Hwy 10E to Hwy 59N to Meridian, MS. Exit 150 in Meridian to Hwy 19N to Philadelphia, MS. Left on Hwy 16, left on Hwy 15, and right onto Hwy 16W. Follow signs to Pearl River Resort.